My idea of a good folk concert is one where the main artists bring on their friends and other musicians and are generous in respect of the time they give them. Blazin’ Fiddles do exactly this. Bruce MacGregor, introduced the concert by pretending to give a news report on Celtic sports imagining the movement of well known stars from one field of sport to the likes of shinty and Gaelic Football. As a spoof item it warmed the audience and set the scene for what must be one of the best concerts of Celtic Connections. 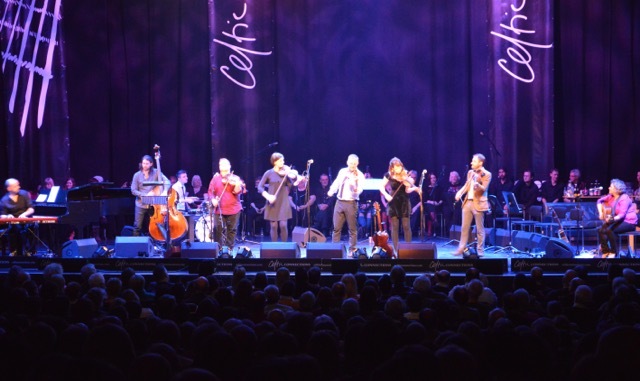 A capacity audience in the Royal Concert Hall were treated to reels and toe tapping tunes from the fiddlers and then the stella performance of first class acts such as Adam Holmes, Rachel Sermanni and Aoife O’Donovan, all stars in their own right. It was glorious! Adam’s rich and throaty voice, singing his own compositions, was seamlessly followed by Rachel’s wistful songs and Aoife’s sweet American voice often adding gorgeous harmonies to each others’ pieces. This and the Inverness Gaelic Choir who backed those on stage as well as singing beautifully in the old language. Sets were woven into a programme that had no dull moments and at no point did anyone hog the stage or allow egos to intrude. Balzin’ Fiddles were superb and during the last set, people in the audience spontaneously stood, giving a standing ovation whilst clapping along to the reels. If you get a chance to see a Blazin’ Fiddles Concert anywhere on the planet, make it a must see.